July 28, 2017 Rob Goodman Comments Off on VP of Creative Katie O’Brien on bad clients, setting boundaries, and landing your dream job. Throughout her career in design, Katie’s approach to creative endeavors and career has been fluid, a purpose-driven path that goes along with the ebbs and flows of the work she loves doing. 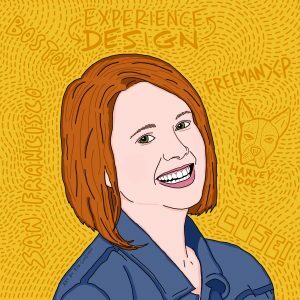 For nearly six years, Katie has been bringing that attitude to her work as vice president of creative at event and experience design firm FreemanXP, out of the company’s San Francisco office in Potrero Hill. With an illustrious career and more than a few success and horror stories under her belt, Katie shares insightful lessons learned along the way to the career she loves today on the latest episode of Making Ways. You can listen to that full episode here. And included below are even more insights from our extended conversation on bad clients (and whether there is such a thing), work-life balance, time management and meeting overload, gender pay equality, and the qualities she looks for in design candidates she’s hiring. So whether you are in a day job working with your manager or at a client-oriented service company, spend as much quality time as you need in the beginning of the project. It will serve you and your work together well. So first prepare for success with your clients. If they are truly bad clients, chances are they aren’t right for you or your business. Katie also has a no-holds-barred approach to spending her time in meetings: “I’ve been known to be in a meeting that if it seems pointless I will leave.” So if it’s not relevant, she’s out. I was shocked when she first explained it to me but soon realized I really love the idea. Being fiercely protective of your time inside and outside the office seems like the road to productivity for Katie. No job will have the perfect balance, but by setting realistic objectives for your time and your needs as a life-loving individual, you can build productive habits that lead to even greater success. The diversity of experience Katie gained working at agencies prepared her for a career in experience design. And now that’s what she looks for in the roles she hires for as well. Katie said, “[My] advice is just be curious and be up for the challenge of figuring something out [on your own]. A lot of people come in like, oh, I don’t do that. If you come from a world of don’t, that’s what you’re going to get. So don’t be stopped from pursuing an area of design that is interesting for you just because your experience isn’t an exact fit. Roll up your sleeves, bring your curiosity and interest in learning more, and get out there. And remember, the breadth of experience you’ve built up over a career, whatever the context, counts for a lot. To learn more about Katie, check out MakingWays.co and listen to her episode on iTunes and SoundCloud. You can follow Katie’s adventures on Twitter and Instagram. If you’re interested in having a chat about experience design, reach out and say hello.